Anime Expo 2016: Art Show Contest! | NIS America, Inc.
Home / Blog / Anime Expo 2016: Art Show Contest! 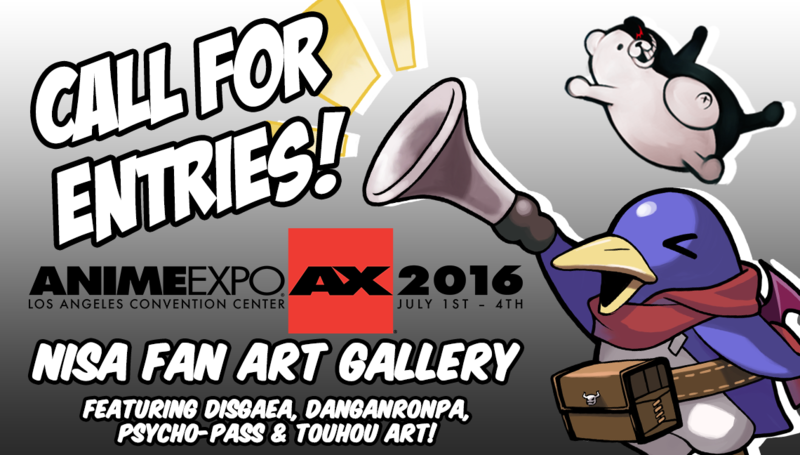 Submit Your Art For Your Chance To Be Featured At Anime Expo 2016! Create a piece of traditional 2D art* set in the Disgaea, Touhou, PSYCHO-PASS, or Danganronpa universes. Send a picture of your artwork to contest@nisamerica.com by June 13, 2016. *See rules for details on what counts as traditional and accepted artwork dimensions. Digital art and prints are not accepted. 3D printed items are not accepted. All art must be family friendly and follow a strict PG guideline. We're using the movie rating system as a guideline. The SPJA reserves the right to refuse any art deemed inappropriate. The SPJA is NOT responsible for lost, stolen, or damaged art displayed at the Art Show. We are only accepting 2D traditional artwork. Please make sure to choose from the following list of mediums to work on: canvas (that can be framed), card stock, paper, or scratchboards. The following artistic media is accepted: airbrush, acrylic paint, chalk, charcoal (soft or hard), coloured pencil, conté, crayon, gouache, graphite, human finger (w/ ink or paint), marker, oil paint, pastel, pen/ink, colored/cut paper, pencil or watercolor. We are only accepting the following dimensions for artwork: 5" x 5", 8.5" x 11", 9" x 12", 11" x 17". When submitting your artwork, please take a picture of your work and do not send your artwork to our offices until notified. The last day to submit your artwork is on June 13th, 11:59pm PST. We will pick 10 winners on June 14th and provide further information regarding submission of artwork. But that's not all, dood! During Anime Expo 2016, the attendees will be checking out the NISA Art Show and voting on their favorite piece of art by using the designated hashtag (stylized as "#" for you non-millenials) to vote! Out of the 10 pieces of art displayed at the Art Show, the People's Choice winner will receive a $100.00 gift card to the NISA Online Store! Phew, that was a lot to explain! But it was all worth it! We're all excited to see your art, so... Best of luck, dood!